We celebrated Mabon late this year. 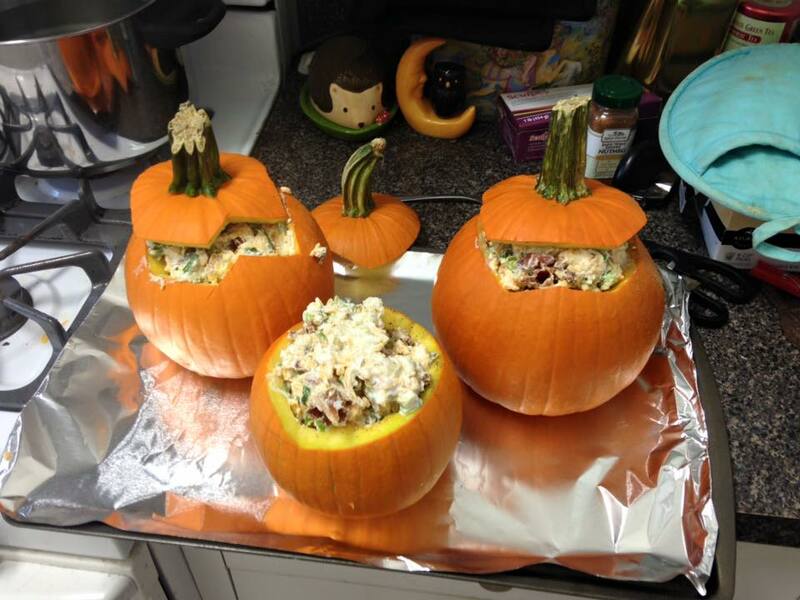 I stumbled across a recipe for stuffed pumpkins that was an absolute hit. This would also be a great Samhain recipe. 1/4 pound cheese, such as Gruyère, Emmenthal, cheddar, or a combination, cut into 1/2-inch chunks (I used shredded Velveeta. One of the complaints I heard about the original recipe is that the chunks of cheese didn’t melt all the way. The shredded Velveeta was perfect). Preheat oven to 350 degrees. 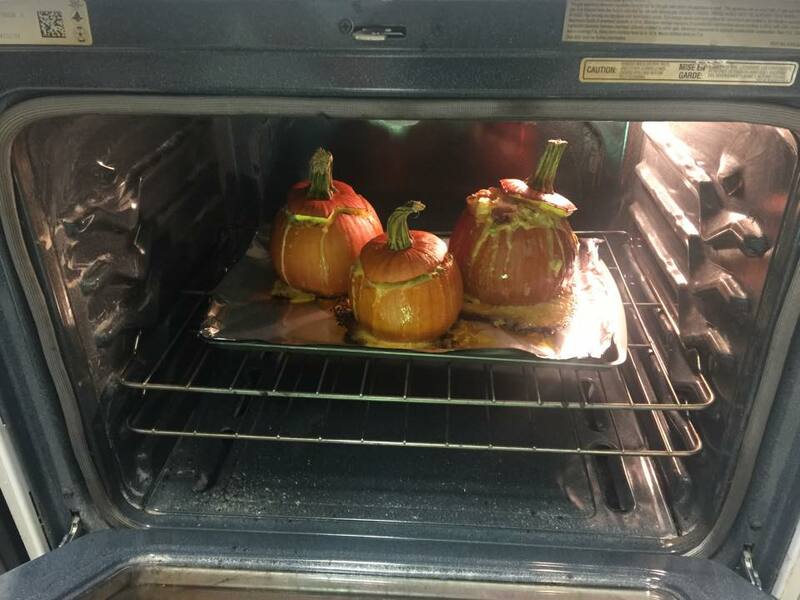 (I put my pumpkins on a cookie sheet and stuck them in the oven first to make sure that they would fit and that I wouldn’t have to move my racks around after I had already heated my oven). Take your pumpkin and remove the cap, just like you would do when you are carving pumpkins for jack-o-lanterns. Make sure you cut a big enough cap that you can work in the pumpkin. Clean out the seeds and strings from both the cap and the pumpkin. (You can get rid of the guts, but I set mine aside to roast pumpkin seeds for later). Liberally coat the inside of your pumpkin with salt and pepper and then set the pumpkin with cap on your cookie sheet for later. Take the bread, cheese, garlic, bacon, and herbs and toss them all together in a big bowl.The original recipe called for the cream to be poured over the mix after the pumpkins are stuffed, but I went ahead and poured the cream in with the stuffing before stuffing the pumpkins and this worked really well for me. Season with more salt and pepper. When everything was mixed together, I took a taste and adjusted my spices as needed. It was good even before cooking! Spoon the stuffing into your pumpkins. I packed mine pretty full, but make sure you can put the pumpkin cap back on when you’re done. I had a little stuffing left over, I set it aside to bake in something later. Cook your pumpkins at 350 for 2 hours. The original recipe suggested checking after 90 minutes. I cooked mine in total for about an hour and forty five minutes and they turned out perfectly. The pumpkins will overflow, so make sure your baking sheet is covered. Be careful when you pull your cookie sheet out of the oven. The pumpkins will be very full and very wobbly. You can cook them in a casserole dish, but I liked how pretty they looked standing free on the table later. You can either serve it by scooping the pumpkins out, or do what I did and slice them into quarters and serve the quarters.